These days, it’s not uncommon for self-identified style bloggers to start their own clothing lines or collaborate with larger brands on capsule collections. Elin Kling, however, is not your average blogger. The Swedish fashion editor launched her own magazine, Styleby, in 2011 with Bonnier, one of the largest Swedish media groups to date, and has since gone on to transform her personal website into it’s own media platform of sorts, known as The Wall. Not content with her already-amazing accomplishments, Kling decided about a year ago to fulfil her lifelong dream of designing a collection. Those who are familiar with Kling will know her for her impeccably refined style, always pared-back yet endlessly cool. Whatever the Scandinavian version of "je ne sais quoi" is—Elin Kling has it. That same effortless beauty has carried over into Totême, the ready-to-wear clothing line she started with her husband Karl Lindman. And remember what I said about not being your average blogger? Well, the clothing line was picked up by Net-a-Porter within weeks of it’s launch, and no, that is definitely not the norm. It quickly became clear that this brand was worth keeping on our radar, and seeing how well made the pieces were up close only confirmed that. While the line echoes minimalist ideas popularised by brands like The Row or Celiné, there’s a through-line of sports and travel that makes it decidedly it’s own. The clothes are instant-classics, perfect for women of any age, and thus totally modern. 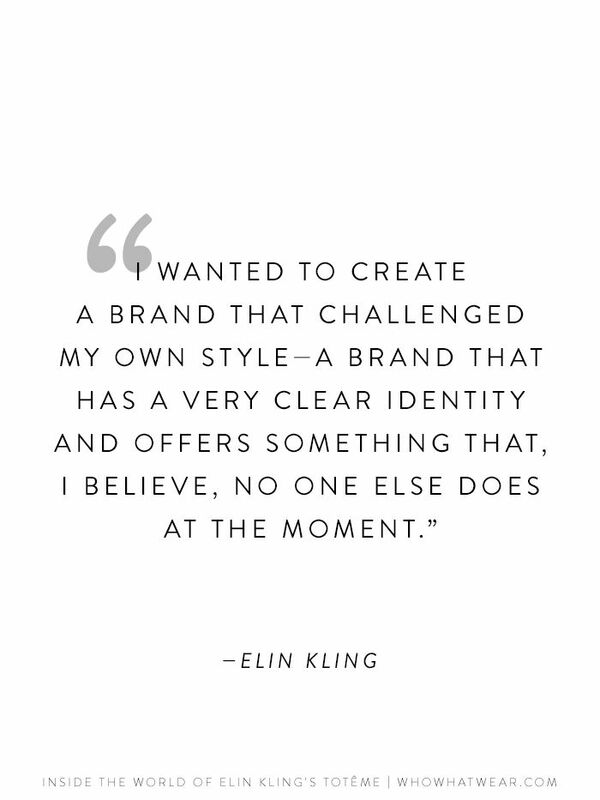 Curious to know more about what went into creating this covetable collection, I had a long chat with Kling about the brand’s origins, it’s future, and how her life has changed since it’s launch. Scroll down to find out what Kling had to say and shop our favourite pieces from Totême! How did the idea for Totême first come about? Well I’d been tempted to start a line for a really long time, but I’d kind of been holding off until I knew exactly what I wanted to do. I wanted to create a brand that challenged my own style as well—a brand that has a very clear identity and offers something that, I believe, no one else does at the moment. To be honest, I was actually on a flight from New York to L.A. during Hurricane Sandy—we had had to leave our apartment, and I had to pack my things in about 10 minutes, in total darkness—and while sitting on the flight, I was like, I wish I had a wardrobe that I felt as confident in for travelling as I do in my New York style, like when I go to the office, etc. So I began to think about that, and about creating an advanced contemporary lifestyle brand with a focus on travel—the perfect travel essentials but with styles that you can adapt to your city life. You know, at a resort or something, I always see different women wearing amazing clothes, and they always look so confident and cool and really relaxed, and I’ll be standing there next to them in my denim shorts with a T-shirt thinking Hmm I want to look like that, too. So that’s why I decided to start Totême. So when you design, do you design for specific seasons? Or do you try to cover them all in each collection? We do both. You know, we design for fall/winter and spring/summer, but what [those collections] all have in common is a slightly preppy tone—taking the American sportswear references and updating them, making the look more modern, with a European twist. For fall I always have ski resorts in mind, with a lot of ribbed shirts and oversized knits. We make our cashmere sets, with cashmere leggings, that are perfect for travelling, but they’re right alongside the breezy dresses and polos. I like the idea when you’re packing of finding styles that work whether you’re going to the beach or out to dinner, depending on how you style them. It makes for a more effortless, confident look—or at least that’s what I’m trying to achieve with Totême. When you did decide to start Totême, how long did it take you to fully launch the brand? It was about a year. But you know, when you really want something, you want it to happen really fast, so if it had been up to me it would have taken like four to six months. But we had a great launch last May, so exactly a year ago, and we were very happy because Net-a-Porter started to work with us from the very beginning, which was a big deal for us, obviously. So now we work with them, as well as a few carefully chosen stores in Europe and the U.S., and for next summer, we’re going to focus a lot more on the U.S. market. Are you planning to open your own store or just expand on the stores that it’s currently sold in? We’re going to expand on where it’s sold, but we'll also focus on opening our own store, although that won’t be within the one-year time frame. Since I’m based in New York, the first one would probably be here, although there’s competition with Stockholm, which is where I’m from. Do you think that being Scandinavian has affected your designs in any way? I’m sure it has in some ways. Scandinavians, and Swedes especially, have a very strong aesthetic—it’s a bit more unisex. I would say that Swedish women tend to dress more modern [than most], with a lot of confidence, which is definitely reflected in Totême. You know it’s so much about the actual woman and how she wears the collection, and I don’t really mean the styling, but how she moves and her as a person—her humour, her confidence, what she does, etc. I’m not inspired by the trendiest women. It’s more about who a woman is and what she believes in. Are there any women in particular whom you think of when you design? I don’t have a particular person in mind when I’m designing the collection, even though I’m sure that would be helpful. It’s really a mix of inspiring women from today to icons from the past. But I also find a lot of inspiration elsewhere, [whether it’s] travelling to furniture to just living in New York. How about when it comes to women you’d love to see wearing your clothes? Well, first of all, I’m so happy just to see anybody wearing my clothes! You know, when I see someone on the street wearing one of my coats or dresses, it’s very unreal, and it makes me very, very happy. We have this dress called the Belize dress, which is an oversized, fine-knitted dress that is laid-back but still extremely stylish, and I’d love to see Carine Roitfeld wearing it in the French Riviera. I did see Vanessa Traina wearing one of our Chelsea coats in SoHo while getting her morning coffee, and I was like Ah! That’s my coat. So it’s really amazing to see more and more people wearing my designs. Your recent campaign starring Sasha Pivovarova was amazing, and it was shot by the famed Craig McDean! Can you tell me how that came about? Yes, and also styled by Karl Templer—so it was definitely a dream team for us! My husband, who I actually run the business with—and we’re still married, believe it or not [laughs]—he’s also the design director of Interview Magazine, so he’s been working closely with Karl Templer for a while, and Karl has been so supportive of the brand, so we were very excited to find out he wanted to help us create this campaign. And I had no personal connection with Sasha; I just admire her as a model and think that she’s a very cool woman who felt very right for this season. Have you started planning the next campaign? Yes, we’re actually planning it as we speak—I need to get ahead a bit because I’m actually expecting my first child in July, so I’m trying to plan ahead for once. Hopefully we’ll work with the same team. Has your pregnancy affected the way you think about design or your brand in any way? Well we always work with a fit model during fittings, but I also like to try and wear every piece myself, because if I don’t want to wear something myself, then it doesn’t make sense [to produce it], and that hasn’t been so easy since I have a big belly right now. And also when I look at some of the pieces now I’m like geez, this is so small! Would you ever design maternitywear? I don’t think so actually, and someone else asked me if we’d ever do a baby collection, but no, I think we will stick with what we already do. Are you planning to further explore accessories or shoes? Well our Biot sandal was actually one of our best sellers, and we also have our towel that’s been very good branding-wise for us. And these are styles that we’ll continue to repeat—I like that idea of repeating pieces overall but just offering them in new fabrics and colours. It’s also very important for brand identity. I want my customers to know where they [can always] find their perfect blazer or perfect shirt. It’s very important to me to grow a business with a strong [foundation], so even though I like in some ways to rush things, I want to take one step at a time [with Totême] to ensure good quality. The clothing industry is extremely complicated, and the brand is 100% self-financed, so it’s totally owned by my husband and I, and I like it [that way] for now. ?How have your other roles changed since starting Totême, like your website The Wall and your work for Styleby Magazine? Well I started the magazine with Bonnier in Sweden, and I’m still a part of it—I work as the creative director, even though my time is more limited than it used to be. It’s really my baby, so I like to still be a small part of it. And for my site, I don’t know how I would ever close that down, because it’s been with me for so long and it’s such a big part of my identity. It gives me a place to express my style and what I do, and to hopefully inspire my readers—so I definitely still work on that even though timing is an issue. It would be nice to work a little less soon! Will you be taking off a lot of time when you have your baby? We’re definitely working on a structure where I’ll have some time off, but I’m not going to have it as good as my Swedish friends. They actually go on maternity leave for a year and a half! But even if I did live in Sweden, I don’t think that [timeline] is really for me, because I have so much passion for my work. So, I’ll definitely take the time off that I need and that I want to have, because I know that [initial] time with your child is not something you can return to, but I also know that one part of my showroom will be [designated] for my stroller. We actually recently moved offices so that it’s close to my home, too, so I can easily walk back and forth. I just hope that my employees don’t have anything against babies [laughs], because there will be one here. It’s eight people right now, between here and Stockholm. We will have to grow as the brand does and also to help with our plans to expand in the U.S., even though I always prefer as small of a team as possible. I think it’s very important to work closely with each other, where [all the different teams] get to understand the whole business. Are there any brand owners who you look to for inspiration, not because of their aesthetic but because of how they run their companies? I like the way that brands like Ralph Lauren or Hermès have built themselves up. I want to offer our customers a world the way they do—I think that’s very important, because there are a lot of contemporary brands on the market that offer something for everyone, which is great, but I think some of them are missing out on that strong identity. Acne, I think, is a great of example of [creating a specific identity], even though their prices are quite high in the U.S.
How about the brands you’d love to see people wearing with Totême? My goal is for the same customer who shops at Céline or Hermès or Balenciaga or Proenza to mix those styles with [pieces from] Totême. I believe that’s how women shop today. A good example of that is The Apartment in New York, which sells a bit of Totême, alongside pieces from Christophe Lemaire or Vince, etc. I’ve followed your blog for years and have seen the different transformations you’ve gone through, so I’m curious what advice you’d give to young women who are trying to find their style footprint in the way that you so clearly have? I would suggest looking back in your wardrobe to see what you have, and then actually using what you have but just styling it in different ways. An easy way to do that is playing with the silhouette—you know, pairing skinny jeans with an oversized shirt, for example, that can be enough. It might sound weird because I run this site that’s so much about shopping and inspiration, which is so fun, but I believe it’s important to [mainly] buy pieces that you’ll want for more than a season. I like to see other women repeating pieces from their wardrobe in different ways. I think that gives your own style more [distinction] rather than when you’re always looking for something new. Even if I get tired of my accessories, I kind of hide them for a while, and then after a season or two I look at them again, and they [often] fit into who I am that day. Those small details can refresh and renew your style. [This method] makes your life a lot easier, too, when you don’t have so many options. I hate having to make too many decisions in one day. My suitcase used to be so heavy and filled with stuff, [but] I would end up just using two or three pieces. Packing now is a dream because of Totême—I have all the styles that I need. If somebody could only buy one item from Totême, what would you recommend she buy? I would recommend the Belize dress for summer and the Chelsea coat for fall—the dress because I can guarantee you will never change your mind about it; you can wear it for any situation. I’ve worn it for nighttime with heels, to the office, and on vacation. It gives you a cool look and attitude while also looking effortless. The Chelsea coat has been one of our best sellers, and it’s named the Chelsea because I was taking a morning walk through the West Village up towards Chelsea, and I saw this old man walking around in his robe and I thought Wow, he looks so cool, so I wanted to create a coat that [mimicked] that and looked like something you just threw on, but with amazing fabric and detail. I spent a lot of time on that shape, and I’ve actually been wearing it throughout fall, winter, and spring—it’s getting a little too hot now, unfortunately—but I haven’t tired of it, and that’s a good sign for me. Which piece from Totême would you most like to have in your closet? Let us know in the comments!